Formed by an Act of the California Legislature on June 14, 1933. The district conserves surface flows of the Santa Ana River for groundwater basin replenishment. OCWD protects Orange County’s rights to the natural flows of the Santa Ana River. Developed renewable water supplies for groundwater basin replenishment and repelling saltwater intrusion. Aquired and constructed spreading grounds from the 1930’s to 1980’s to enhance underground basin replenishment. Cooperates with Orange County Flood Control District and Army Corp of Engineers in managing discharges from Prado Dam. Constructed rubber dams to improve the diversion of surface flows into spreading grounds without diminishing the flood capacity of the Santa Ana River. Innovative design of Basin Cleaning vehicles for removal of fine-grained sediment deposits from the bottom of deep basins without basin dewatering. Injection of reclaimed water underground to establish barriers to seawater intrusion and enable basin overdraft during extreme drought conditions over watersheds of imported water sources. 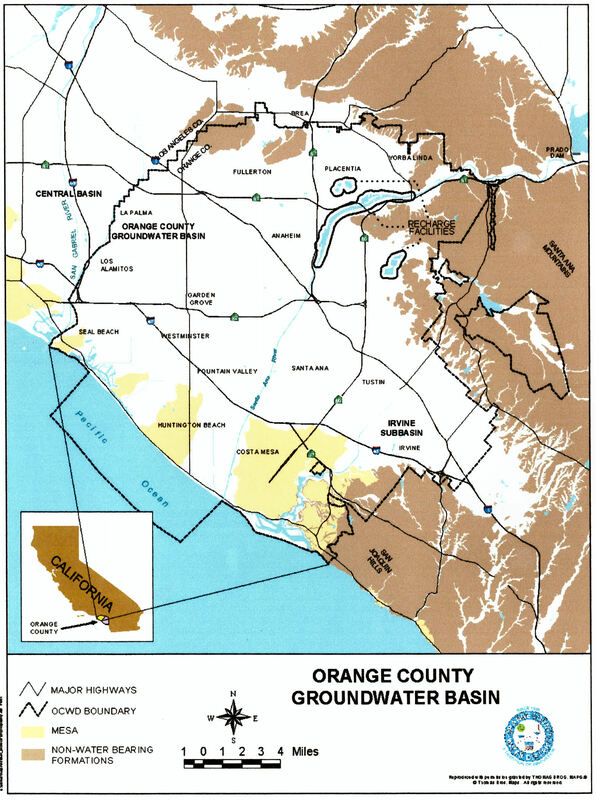 The Orange County Water District was designated as an Orange County Historical Civil Engineering Landmark in 2006. Due to construction of the Groundwater Replenishment System, the plaque was not dedicated until 2010. The plaque is located at OCWD Headquarters, Fountain Valley, CA.